Welcome to The Price Gun Store. We are pleased to present ourselves as the nation’s premier distributor of hand held labeling products. A price gun (as they are most commonly used) can have a wide application use in a many different industries. When used for other forms of marking, we will use the term label gun vs. price gun as pricing is not the variable information being printed. From using label guns to print a date, code, batch, lot or any number of other operational (numeric or alpha/numeric) codes, a hand held labeling tool can prove to be the best solution. If at any point you would like to ask a question, please don’t hesitate to give us a call. We have over 35 years of experience in the price gun industry and enjoy helping you to answer questions. We have our phone number very visible on every page of the site and encourage customers to call us. Calling is the easiest way to make sure everything is exactly correct with your order. Purchasing the correct price gun for your unique application can often be a decision to take some time with. We encourage, and will routinely ask questions to ensure we recommend a tool that will provide all the beneficial information you need to be marked on your products. We really enjoy the opportunity we have to explain price guns and help you make the best decision for your application. You can take a look at the About Us page for more benefits of choosing to work with us. Enjoy our website! From Monarch price guns to Meto and Garvey labels, look to B&B Supply. All of the brands we represent are good quality, proven label guns. It seems that each brand has at least one unique feature that is tops in the category. A new buyer will definitely want to check out our package deals for the Sato Kendo or Judo tools. These are an excellent value for both smaller and larger volume users and we are excited to offer them. Some popular options of guns are the Monarch 1131 and the Garvey 22-8. Both of these tools are one-line guns. This means that they print one line of characters on the label. Monarch has been the industry leader for decades. Even their older designed price guns remain popular. This tool was designed in the 70’s and still remains popular today. It isn’t the easiest label gun to operate and we normally suggest new users order a different price gun. However, those that know how to work the gun do seem to like it. What exactly makes a Monarch 1110 better when purchased from our website? 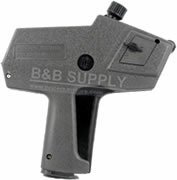 At B&B Supply we offer the price gun with a custom print head that we special order from the manufacturer, Monarch Paxar. There are a total of six stock ways the price gun will print a label. The Monarch 1110-01 prints underlines under the cents. The 06 can allow for date coding with the month, day, and year. The 03 band layout prints all the numerical characters in a large, bold fashion. Most customers like this option the best, however, it only allows for five characters of print. Learn more about the Monarch 1110. This is a quick couple of sentences about the other various brands of tools we sell. The Meto price guns offer a spring loaded print head. This component of the tool allows it to strike the Meto label with a consistent pressure. The Meto, Garvey, and Monarch guns all offer perhaps the most important functionally feature; very easy label roll loading. This is the most frustrating point when using a handheld labeler and that is why it’s very important to us to provide you with something you are comfortable with. Meto price labels will load a bit different from all other manufacturers because their products use a unique feed system. The Towa price gun and XL Pro models are very functional handheld tools as well. An interesting feature of the Towa GS is that it prints in the middle of the price label. This allows for a top and bottom line of custom printing on the Towa label. It is very rare to have that capability with a one line labeler. The Avery Dennison and Primark price guns are typically lighter weight labelers. This can be a nice because your hand will not get as tired, however, the other brands are designed to be very comfortable. 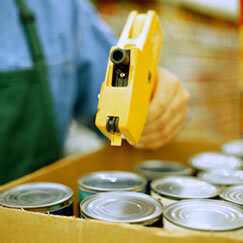 Using a labeling gun to date code your perishable is one of the smartest solutions to this process. The guns dispense the labels quickly, print clearly, and are inexpensive. Check out the details of date code label guns. 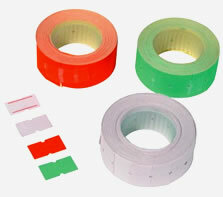 We also offer a lot of label guns free with the purchase of a case of labels. You can give us a call for more details, or take a look at the gun and labels you are interested in. The description section will say if the price gun qualifies.